Gloria's story is the stuff that books are written about. Gloria, a fourth generation Californian, was born in San Francisco. Gloria's father, Patrick Pichi Sun, took a diplomatic assignment with the Nationalist Chinese government and moved his family from San Francisco to Kuala Lumpur, Malaysia when Gloria was one month old. Patrick Sun came over as a foreign student to complete his graduate studies at Stanford University. He married May Lan Chew, the daughter of Thomas Foon Chew, founder of Bayside Cannery in Alviso, California. In its time, Bayside cannery was the third largest cannery in the United States, after Del Monte and Libby's. Bayside had one of their branches in Mayfield, the current site of Fry's Electronics in Palo Alto. World War II had started, and the Japanese had invaded Malaya and Singapore. Gloria's father was awaiting transfer orders, but all communication channels were cut. Refugees wanting to leave could do so with only what they could carry. Gloria's mother bundled her older sister, Gloria and a small suitcase and left her father with her younger sister, Sylvia. They went to China but the war was raging throughout China. They took a freighter by way of Australia, and the three of them finally returned to San Francisco to live with her maternal Grandmother in San Francisco's Chinatown. It was not until the close of the war that Gloria's father rejoined the family. Through the good work of the American Red Cross, Sylvia, her younger sister, was located in the Malay jungles and reunited with the rest of the family when Gloria was ten years old. Patrick Sun was a member of the Chinese delegation at the Inauguration of the United Nations meeting in San Francisco in 1945. After the San Francisco Conference the family left for the Philippines. Manila was recovering from Japanese occupation and "it was a unique period of our history...I always feel that I am so lucky to be part of a transitional time." Gloria spent junior high and high school in Bangkok, Thailand. In her words, "Thailand is the most beautiful country in the world - the people are gentle and graceful." She loves to visit and is constantly amazed at the growth and development of the country. The Sun family moved to Taiwan where her father was the government spokesperson for Chiang Kai-Shek. Gloria attended high school with the Providence nuns in Tai Chung. Once again, her family returned to San Francisco. This time her father was Consul General. Subsequently Gloria's father retired from the Diplomat service as an Ambassador. Gloria went to Dominican in San Rafael for her undergraduate work; these 4 years were one of the benchmarks of her life. At the time, there was only one other Chinese girl in the entire college, "so I had to learn English... I loved the liberal arts and Western Civilization was new and exciting to me." Following the example of her father, Gloria came to Stanford for graduate work. She holds a masters degree in Political Science and Economics from San Jose State University and completed a doctorate at the University of San Francisco in Education. She was a Price Economist for the Department of Labor, Bureau of Labor Statistics and an Internal Revenue Auditor. Gloria's passion had always been in teaching Economics, Political Science and History. Starting her teaching career at Foothill and De Anza she moved to West Valley/Mission College. One fond memory is of taking her classes to the Sunnyvale city council to see democracy in action. Gloria was also an adjunct instructor at San Jose State University and UC Santa Cruz. Last year she retired after 35 years in the classroom. Gloria travels to China frequently introducing interesting and eclectic groups of women to her homeland. "There was so much development, that the national bird was the (building) crane," jokes Gloria. "There is a sense of energy and excitement in China's development that will change in the very near future if we don't capture the experience now." Gloria and Peter moved to their Midtown home in 1968. All three of the Hom girls were born and raised in Palo Alto. Gloria loves the neighborhood, "We are so lucky to live in Midtown. Everything is nearby - interesting people, shops and all vital services. Midtown is constantly evolving and reflects the times." Participation in community activities plays an important part of Gloria's life. She is experienced in fund-raising and community coalition building. She has been a member or president of various boards and associations, such as the Rotary Club, San Jose Historical Museum, Chi Am Circle, YMCA, California Teacher's Association, and the Palo Alto Woman's Club. Her public service is extensive. 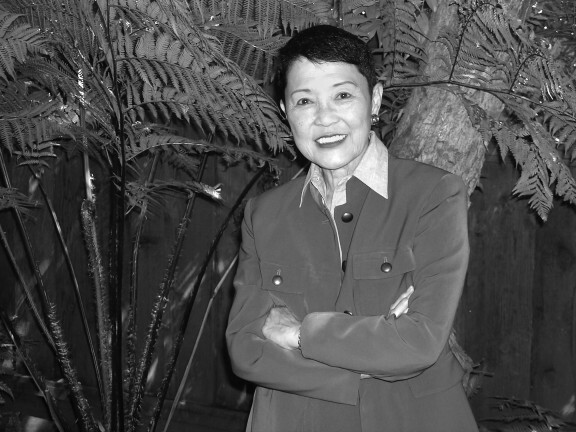 Gloria has received awards for her service from many organizations, including the California State University Board of Trustees, California Board of Education, U.S. Department of Education the White House Conference on Libraries and Information Service, the Sallie Mae Board and the California and Santa Clara County Republican Party. She currently holds membership on the Selective Service Board of Governors. Governor Schwarzenegger appointed her to the State Teachers' Retirement System, Board of Directors where she retired this year.